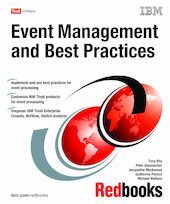 This IBM Redbooks publication presents a deep and broad understanding about event management with a focus on best practices. It examines event filtering, duplicate detection, correlation, notification, escalation, and synchronization. Plus it discusses trouble-ticket integration, maintenance modes, and automation in regard to event management. Throughout this book, you learn to apply and use these concepts with IBM Tivoli Enterprise Console 3.9, NetView 7.1.4, and IBM Tivoli Switch Analyzer 1.2.1. Plus you learn about the latest features of these tools and how they fit into an event management system. This book is intended for system and network administrators who are responsible for delivering and managing IT-related events through the use of systems and network management tools. Prior to reading this book, you should have a thorough understanding of the event management system in which you plan to implement these concepts.